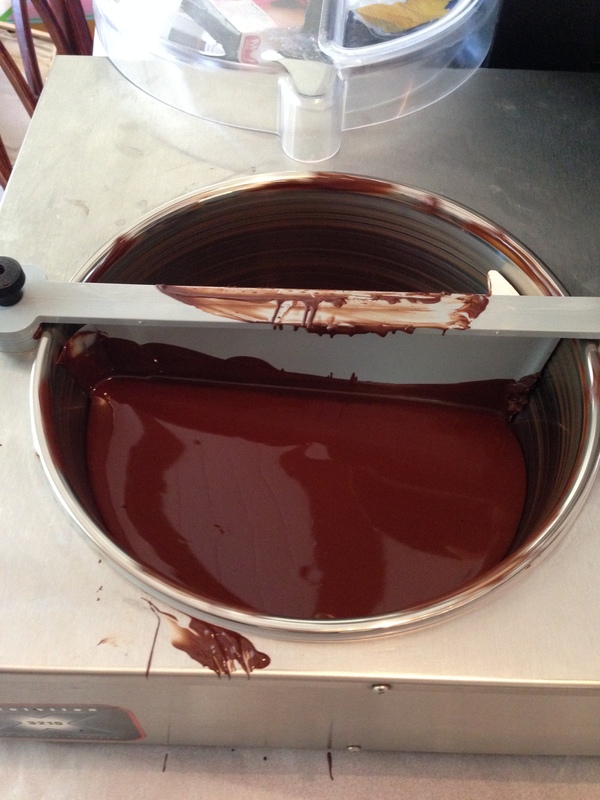 Chocolate tempering machine in action! 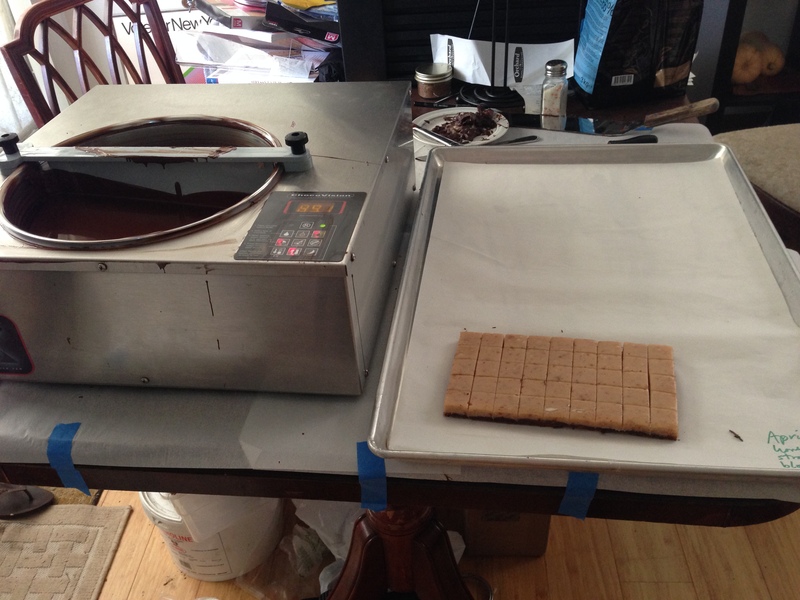 That’s my new-to-me chocolate tempering machine, and it works great except that the scraper “leaks” bits of solid chocolate into the melted chocolate. That means I need to remove the “seed” chocolate before using the machine. That turns out to be better anyway, though – it turns out that the chocolate stays in temper longer if I take out the seed. Something I never realized before, so perhaps the slightly faulty equipment is a good thing! There aren’t that many of them (relatively speaking) – 30-60 of each flavor. I doubt it totals more than 10 or so pounds. But it’s still a fairly sizable number of chocolates. 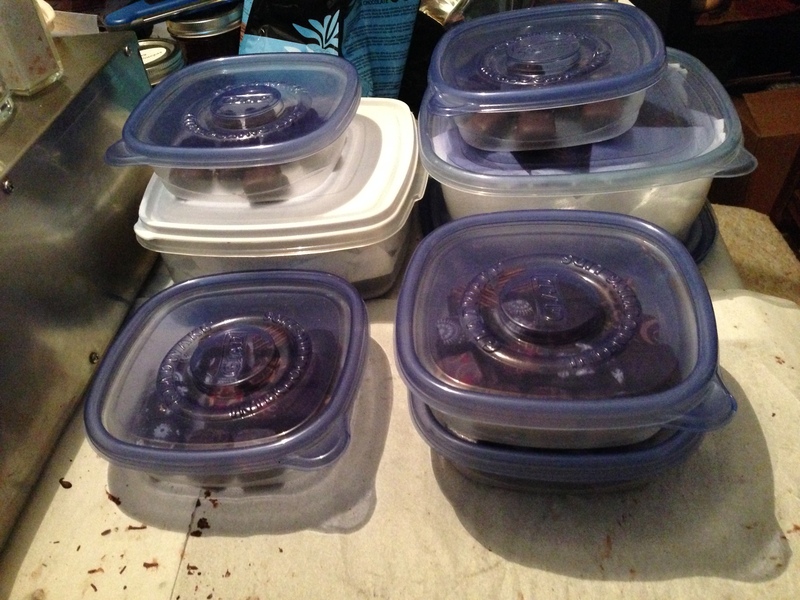 Four boxes are going to lucky friends, the rest are going in to work to delight my and Mike’s coworkers. 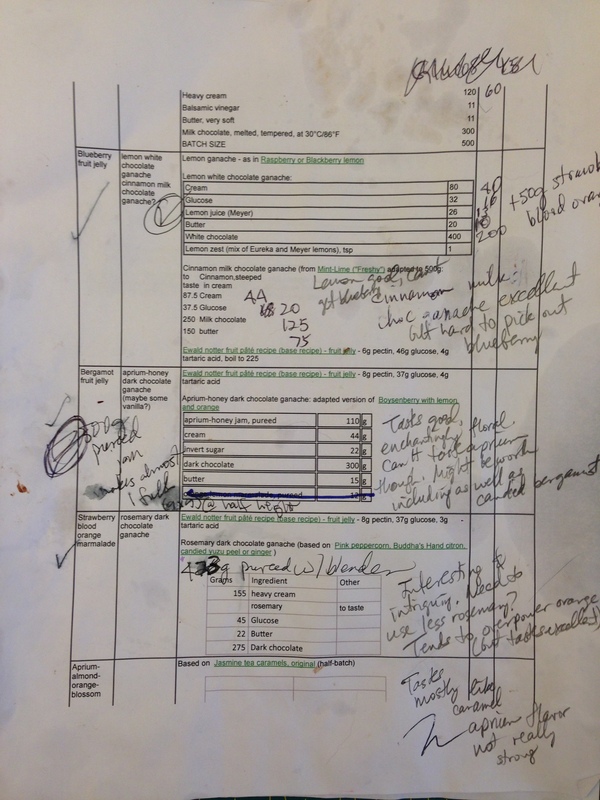 As you see, I tend to make changes on the fly when running recipes through the test kitchen – which means I need to enter them into Evernote afterwards if I don’t want to lose track of what I’ve done. Strawberry jam with rosewater ganache: this was a layer of strawberry fruit gel, made with my sun-cooked strawberry jam, with white chocolate rosewater ganache on top. It came out beautifully – first a strong “hit” of strawberry flavor, super intense and tart, followed by a floral note as the rose fragrance arrived later, and lingered on through the afternote. This is definitely going into this year’s boxes. Aprium-honey jam with blood orange-strawberry marmalade ganache: this was my aprium-honey jam converted to a fruit jelly, with white chocolate ganache mixed with pureed blood-orange strawberry marmalade. 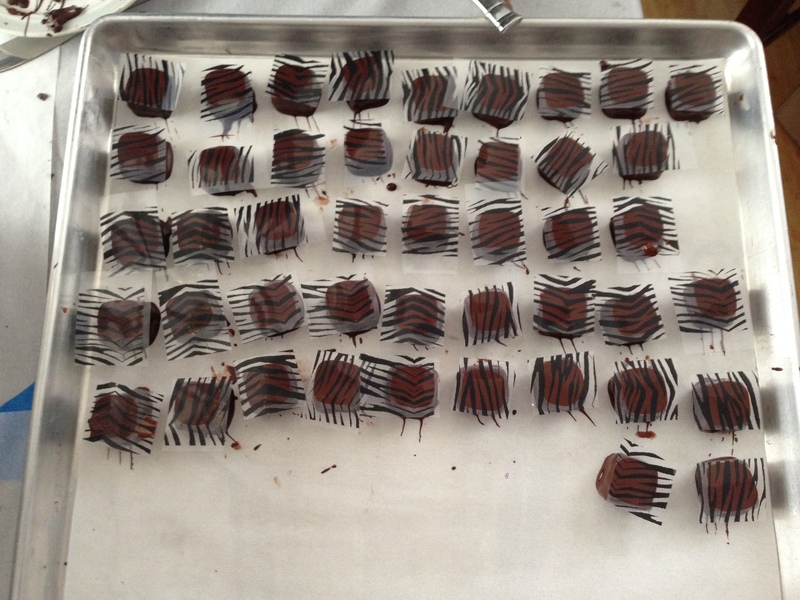 Alas, the blood orange marmalade overwhelmed the aprium-honey fruit flavor, but the ganache was delicious in itself, so I may put just the marmalade-white chocolate mix into bonbons this fall. Blueberry jam with balsamic vinegar milk chocolate ganache: a bit of a disappointment, as were all the blueberry flavors. The balsamic vinegar milk chocolate ganache was tasty, but the blueberry wasn’t identifiable. I had more or less expected this to happen, as (aside from the tartness) blueberry is a pretty subtle flavor and easily overwhelmed – but disappointing nonetheless. Blueberry jam with lemon white chocolate ganache: again, the lemon white chocolate ganache was delicious (and I may include it solo in this year’s flavors), but the blueberry was a disappointment. 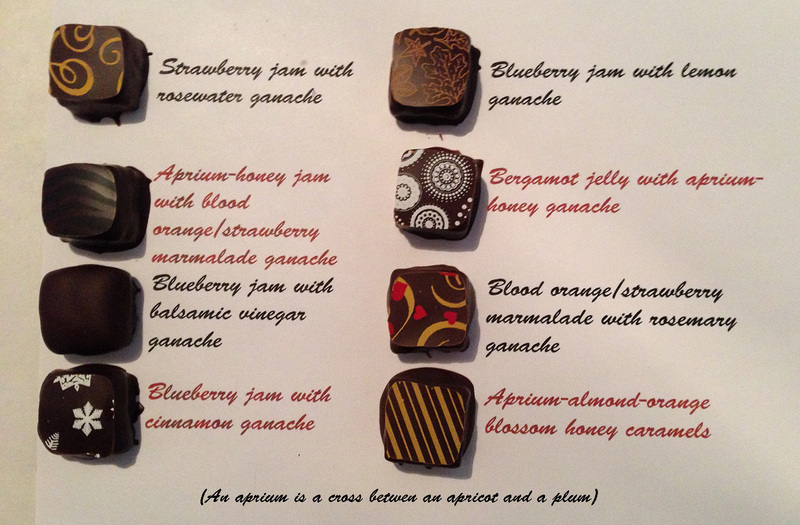 Blueberry jam with cinnamon milk chocolate ganache: the cinnamon milk chocolate ganache was fantastic – I had only tried cinnamon in dark chocolate before, but the lighter milk chocolate flavor really lets the cinnamon shine. 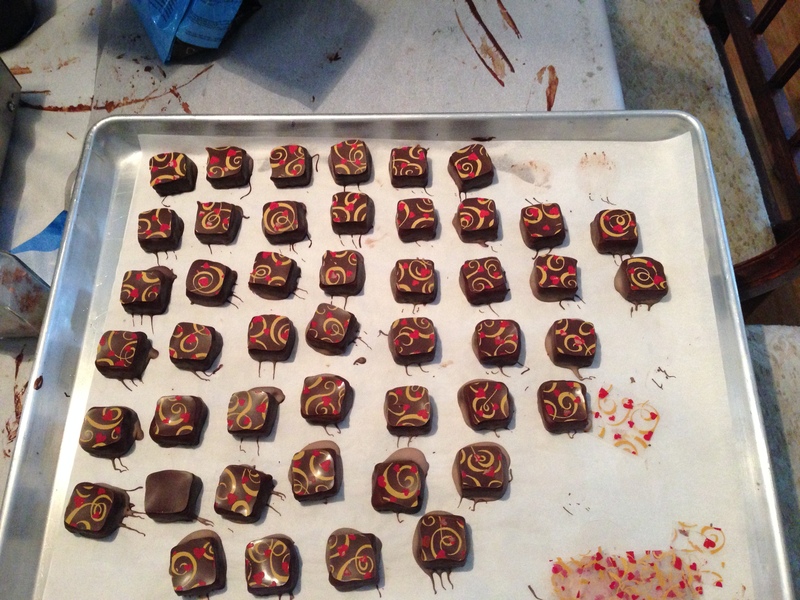 I may use the cinnamon ganache in this year’s flavors: it’s delightful. The blueberry wasn’t really taste-able, though. Bergamot marmalade fruit gel with aprium-honey dark chocolate ganache: this was delicious, with an enchantingly floral top note (from the bergamot). The aprium was not perceivable, though I think it probably added a bit of tartness. Whether to include this is a bit of a toss-up – I hate repeating flavors in the chocolate boxes, but these came out beautifully and showcase bergamot flavor in a different way than my candied bergamot peel dipped in chocolate (which is one of my favorite flavors). So I may include both. Blood orange strawberry marmalade fruit gel with rosemary dark chocolate ganache: This tasted delicious, though the rosemary was a bit too strong, tending to dominate. But delicious nonetheless. Who knew that rosemary went with orange and chocolate so well? I may include it in this fall’s lineup, with a note to tone down the rosemary. 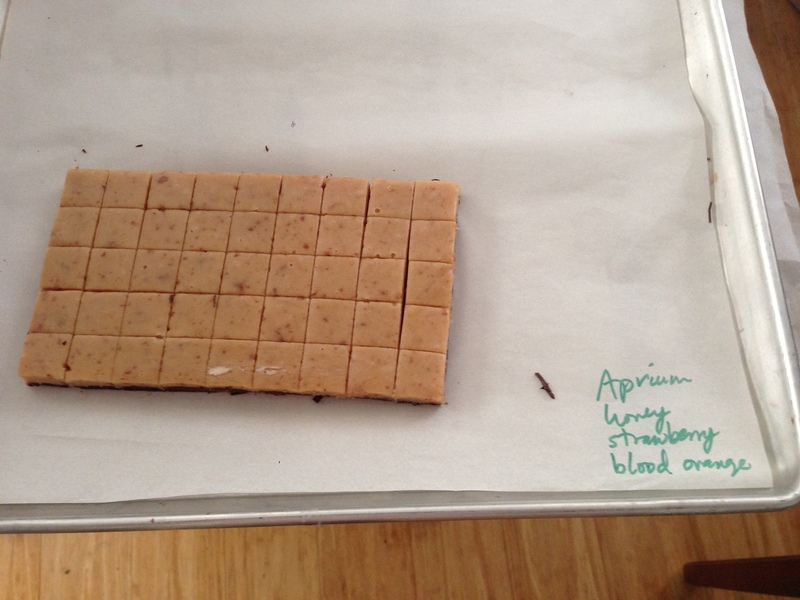 Aprium caramels with almond extract, orange blossom extract, and orange blossom honey: this, alas, tasted delicious as a “pure” caramel, but the aprium and other flavorings didn’t come out clearly when dipped in chocolate. Instead, what I got was a delicious caramel, but without a strong fruit note. Adding lemon juice might have helped, but I didn’t think it was good enough to make this year’s lineup. And that’s that! I have another evening left of cleanup and recordkeeping, and then I can get back to weaving and writing. I really want to get that flyshuttle and auto-advance unit onto the loom so I can get back to weaving! And I have finally finished revamping both sample chapters for the book, which means it’s time to rewrite the rest of the book proposal. My goal for this month is to get the proposal done, to the editor, and (hopefully) start querying book agents again. Yum! Some for the CW Seminars auction? Hmm! Hadn’t thought of the CW Seminars auction. More details? What is it raising funds for? A fun way to raise funds for Complex Weavers biennial exhibit, Complexity. Sunday evening following dinner. A very nice post to read with a morning cup of coffee. I look forward to dipping some of these in fall. And since bergamot is my favorite of the candied peels, I vote in favor of repeating bergamot by including the Bergamot marmalade fruit gel with aprium-honey dark chocolate ganache.